A quiet and humble wife of a church minister, Jaeok Lee has considered herself as a servant who cares about mental, physical, and spiritual health of people. Jaeok has genuine compassion for people who are suffering mentally and spiritually. She graduated from the Virginia University of Integrative Medicine and achieved a Master’s Degree of Acupuncture & Oriental medicine. 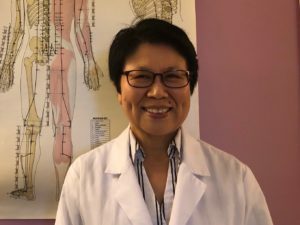 She has a passion for treating people with physical suffering, and being an acupuncturist offers her the opportunity to help people in need. A life long student, she is determined to learn as much as possible, utilizing her experience and knowledge to treat patients with difficult conditions who are suffering greatly. Jaeok is a Licensed Acupuncturist (L.Ac.) with the state of Maryland and has a Diploma of Oriental Medicine by National Certification Commission for Acupuncture and Oriental Medicine (NCCAOM). Originally from Korea, Jaeok is fluent in Korean and English. She began her journey into acupuncture by giving Auricular Acupuncture (initially in Korea) for nearly 20 years. Now, she is in a Doctoral level course to achieve a deeper knowledge of Acupuncture and Chinese Herbology. We all desire happiness and well-being. Without the balance of Qi and harmony of the mind, there is no happiness and well-being. Jaeok wants to be an instrument of emotional and physical healing for the people. Jaeok is a participating provider with Blue Cross/Blue Shield, Aetna, Cigna, and Johns Hopkins EHP.